Do highly sensitive people get energized in the country and out in nature? Highly sensitive people and empaths typically love to be out in nature and get energized by the quiet and beauty. It’s a wonderful place for sensitive people to live. Empaths also have an intimate communion with nature, including with the Earth, plants, and animals. Earth empaths are a special type of empath who are keenly attuned to the natural world and all of the Earth’s changes. The beauty of a waterfall can exhilarate and energize these empaths, whereas the toxicity of air pollutants can make them feel sick, exhausted, or depressed. To learn more about being an earth empath read my article The Power of Being an Earth Empath. It’s important for all empaths to practice centering and protection techniques that I discuss in The Empath’s Survival Guide. When interacting with people empaths must learn to set clear limits and boundaries and have their own space. Then relationships can be healthy, possible, and fun! 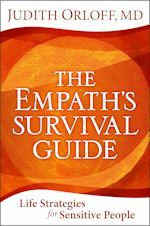 Please read the chapter on relationships in my book The Empath’s Survival Guide.